Let's just bask in Cole's torso one last time, shall we? We've got some contenders on The Voice! 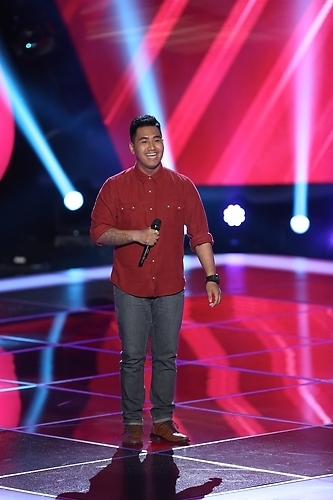 JR Aquino is 24 and from Anchorage, Alaska. No, he doesn't live in an igloo, travel by dog sled, or ice fish. JR got his start in the small music scene at home, then found huge fame on YouTube where his videos have gotten over 50 million views, making JR one of the top subscribed musicians. 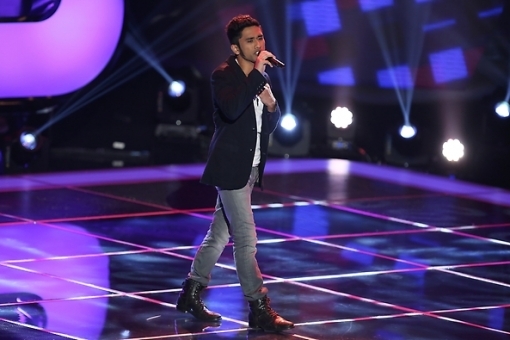 For his blind audition, JR sang "Just the Way You Are" and got early turns from Christina and Adam. Ceelo joined them at the very last second. After chatting with the amiable JR, Adam commented that he sounds a lot like Bruno Mars, though Ceelo noted that JR had some trouble with his high notes. There was surprise at his residence ("I know it's weird because I have a tan") and his ability to have a music career up north ("there's bars...there's three"), but the judges were duly impressed with JR's YouTube fame -- an original song he wrote hit 5 million views the week before the audition. In the end, he chose Ceelo as his coach because he appreciated the honesty of the judge's constructive criticism, and his sweet parents backstage couldn't have been more proud or overjoyed. Aww! Joining JR on the Voice is Benji Kuriakose, whose background story is that he raced cars until he ran out of money to do so. Huh? Not exactly a tear-jerker. Anyway, Benji sang "Knockin' on Heaven's Door" and got Adam to turn around right away; Ceelo, once again, came around later in time to see Benji scream/sing his last note. "What's your NAAAAAAAME?" Ceelo screamed in response. Heh. Adam pointed out that Benji had the ability to clean up the rasp in his voice and "make it really pristine," an especially impressive feat because people with raspy voices often can't exert that kind of control. Ceelo, meanwhile, heard a bit of Adam in Benji's tone. Perhaps for this reason, Benji chose to join Team Adam and in the post-performance interview said, "Today does affirm that giving up racing was worth it." Still not sure that's the "sob" story you should go with, dude. On Project Runway, we got a tiny peek into the softer side of Ven when the designers got to go out to dinner and enjoy some wine. Ven explained that he's 28 and his sister is in her 40s, so the big age gap meant that he was alone a lot growing up, and it's a state he's experienced throughout his life -- even in the Project Runway workroom. He also helped Melissa later on when she was having trouble with her garment, a selfless task that Ven took on with no pomp or hesitation. But hold on, (relatively) lovable Ven is still Ven: his insistence on keeping his Rockettes outfit "clean and modern" meant that it...wasn't really a Rockettes outfit. Is it just me or does the model even look unsure of this dress? Heidi felt there was no design or story to Ven's piece. "The dress has to sing and dance on its own...it's really boring." Michael thought it looked like a mother of the bride dress cut short, and during deliberation he reached bitchy comment nirvana when he said, "He didn't do his origami flower festival for once. That could be his drag name: Origami Rose." Okay Kors, I'll admit that was well played. Despite the ornate drag name, Ven's dress was deemed too simple for the Rockettes challenge, and he was sent home. I do like your flowers, Ven! It just doesn't work to bring them back over and over in this format.... Still, I'm sure your line, post-Project Runway, will do great. On Broadway or Bust, we got to the exciting conclusion of the musical theater contest. Sabaa sang "Waiting for Life" from Once on the Island, and we heard insight from one of the judges who called Sabaa a "nontraditional casting" and (cringe) "exotic." He also said that her voice had a "brightness" to it, but the more he heard her sing, the more he could hear what an incredibly young singer she is. It's obviously tough to hear the comments that, stated so bluntly, quickly and painfully oversimplify people -- practically a child, in this case (and I'm not even getting into the fact that the kids who got the solos in the Lion King group performance were ALL African American...). At the same time, it's hard to deny that theater audiences likely have expectations of who they want to see on stage in certain roles. So, it's heartening, then, to see young, talented performers like Sabaa still trying to get these perhaps unreachable parts, and doing so in front of a national television audience. One last hurrah on the finale of So You Think You Can Dance: Cole re-performed his truly amazing paso doble with Lindsay, Alex got to bring back his haunting performance to "Bang Bang" with Eliana, and Marko joined in for a big Lion King (there it is again!) group number. It was an amazing season, and I already can't wait for next year! See you next year, Alex?? On the season finale of Awkward., Ming gets thrown another seemingly random curveball when Fred tells her that he's moving to a different school...even though he lives across the street from Ming's high school. This odd redistricting was all thanks to Becca, who doesn't even appear in the episode, but her presence is strong. "I'm afraid she's going to hurt you," Fred said as an explanation to why he has to leave Ming. When Ming tells him she can take care of herself, Fred's responds with, "That's the thing, you can't." And with that ominous warning and a sweet kiss, Fred was off and the season ended. Will Ming get revenge on Becca? Guess we have to wait until next summer! And finally, Salman Rushdie appeared on the Daily Show to promote his new memoir Joseph Anton. It sounds great, and I'm pretty sure that reading it will get you instant and plentiful intelligence points the next time you're at a party.